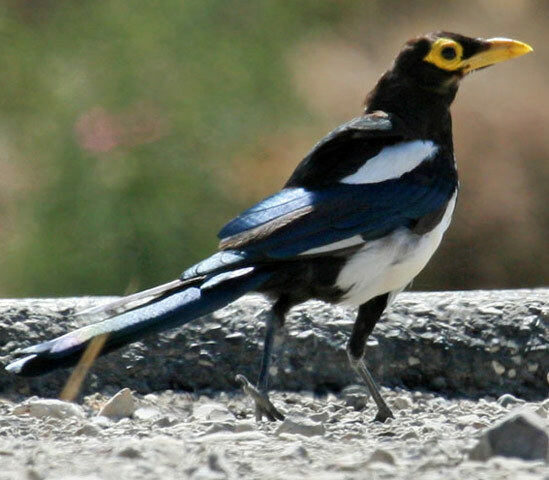 Yellow-billed Magpie: Resident in California's Central Valley and adjacent foothills. 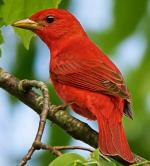 Preferred habitats include oak savannas, oak woods, riverside growth, ranches, and suburbs. 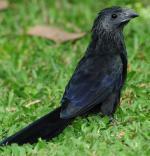 In one type of display, neighboring birds will walk side-by-side along the boundary of their two territories often with tails held upright. 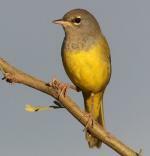 It is believed that these birds have declined significantly in population since the arrival of West Nile virus in California in 2004. The ancestors of the Yellow-billed Magpie likely became isolated in California very soon after they colonized North America some 3 to 4 millions years ago. This was due to ice ages and the uplift of the Sierra Nevada. A group of magpies has many collective nouns, including a "charm", 'gulp", "mischief", "tittering", and "tribe" of magpies. The Yellow-billed Magpie has a fairly large range reaching up to generally 83,000 square kilometers. 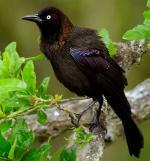 This bird can be found in its native United States where it appears in forests, pastureland, arable regions and even rural garden. 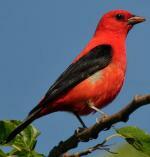 The global population of this species is estimated to be around 180,000 individual birds. Currently, it is not believed that the population trends for this species will soon approach the minimum levels that could suggest a potential decline in population. Due to this, population trends for the Yellow-billed Magpie have a present evaluation level of Least Concern.